The Bubble Nebula is an H II region emission nebula in the constellation Cassiopeia. It’s iconic “bubble” shape was created from the stellar wind created by the intensely hot central star (SAO 20575). The Bubble Nebula lies very close to an impressive open star cluster known as M52. This cluster can be captured within the same field of view as the Bubble Nebula using a wide field telescope or telephoto lens. Through a large telescope under dark skies, the Bubble Nebula appears as an extremely faint shell around the central star. Unfortunately, it is not possible for me to observe this faint emission nebula from my city backyard through a telescope eyepiece. Photographing the Bubble Nebula with my camera and telescope is an experience I will not soon forget. In the fall of 2016, I spent almost 2 months straight capturing data on NGC 7635 from my backyard. Do you ever look at your old astro-images and think to yourself, “what was I thinking?”. That was the case with my old Bubble Nebula images of the past. I can’t think of a deep sky object I’ve spent more time processing and adjusting. 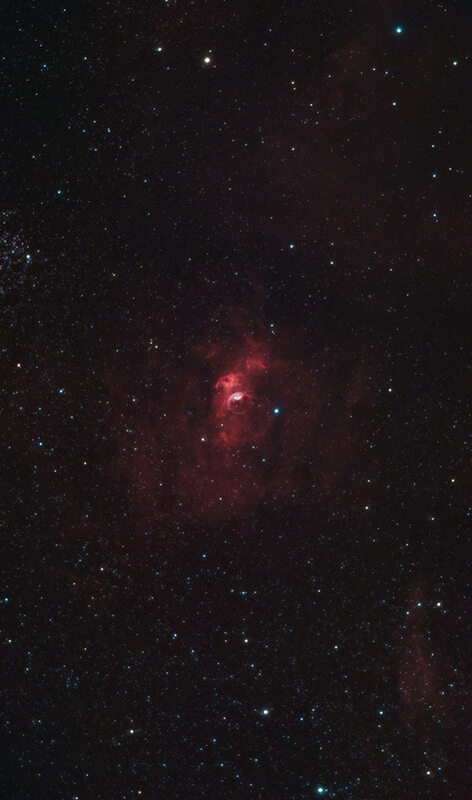 The Bubble Nebula is a challenging target due to the low surface brightness and dim details that are hard to pull forward from a light polluted sky. To capture NGC 7635 from the city, narrowband filters are a must. In this case, it’s simply a matter of not having enough integrated exposure time (and perhaps lack of planning.) I have come to the conclusion that I need to start this project over with a plan that includes isolated narrowband OIII data. The telescope used for my previous images of the Bubble Nebula was an Explore Scientific ED102 CF Refractor. This is an incredible telescope for astrophotography, with a native focal length of 714mm. The camera used was a modified Canon EOS Rebel T3i (full spectrum modification). 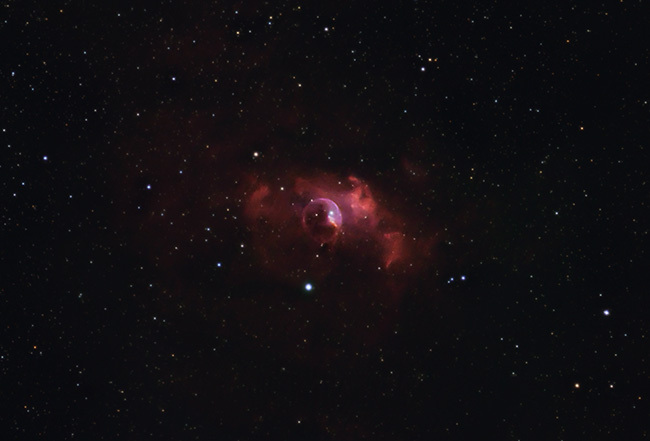 The photo above is a composite image of the Bubble Nebula photographed in both RGB and Ha. The RGB version of the image simply means it was photographed in regular full color with a DSLR Camera. The (Hydrogen Alpha) was captured using a clip-in DSLR Ha filter in the camera. By combining the RGB and H-Alpha images together, more detail can be presented. 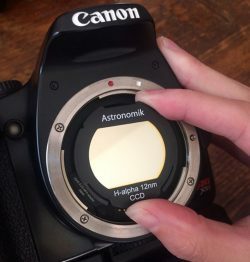 The filter I use is the Astronomik 12nm Ha Filter for Canon EOS cameras. It clips into my Canon T3i/600D camera easily with no extra adapters needed. This filter blocks out almost all sources of light other than a narrow wavelength of Hydrogen Alpha. Because of this, I am able to capture images during the full moon, and through heavy light pollution. Although the CMOS sensor in the camera captures color images, the ha filter renders a grayscale image to use as both a synthetic red channel and/or a luminance layer. 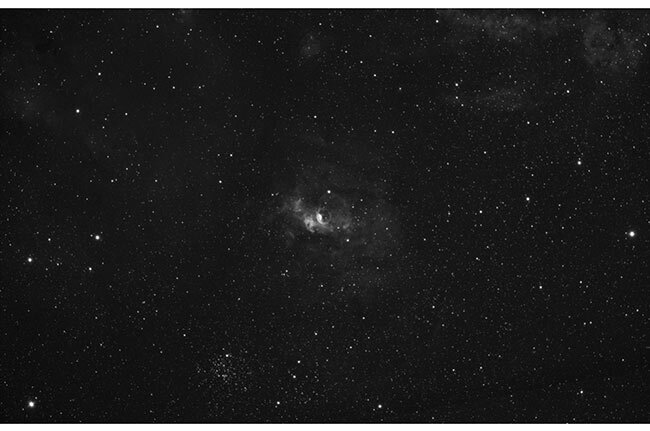 A camera with a monochrome sensor can harness the full power of narrowband astrophotography. However, the CMOS sensor found in your DSLR camera can also be used effectively. Learn more about capturing narrowband images with a color camera. The photo above shows just how much the final image was cropped, and the size of this target at a focal length of 913mm. The size of the camera sensor changes the FOV by 1.6X, and the focal reducer brings it back by 0.8X. I reviewed the Altair Hypercam 183C camera extensively in the summer of 2017. This camera was an excellent entry-level astronomy camera, capable of impressive 30-second exposures that had plenty of detail and color. If interested, be sure to read my review of this camera. This object is quite difficult to capture from a light polluted backyard! The Bubble Nebula is extremely faint and requires many hours of exposures to pull forward. Even with the additional Ha data, the HaRGB version was a little disappointing to me after so many hours of work. Adding additional images captured using an OIII filter with my DSLR should help reveal the full structure of NGC 7635. I learned a lot about capturing Ha Data and combining it with RGB through this project. The toughest part of the process is finding the right balance between the 2 versions. Too much Ha – and you lose the natural color of the nebula. Too much RGB – and you are leaving out significant detail in the object. One trick I found to be useful was to use the star colors from the true-color image as a final overlay. Meaning, I placed an RGB layer on top of my HaRGB composite using the “lighten” blending mode in Photoshop. This corrected many of the miscolored stars produced when merging the Ha data. I would like to tackle this astrophotography project again, but this time using a new camera and filter. I believe the ZWO ASI294 MC Pro with a Duo-Narrowband filter attached could produce some amazing results from the city. As for the telescope I plan to use, the William Optics Zenithstar 73 should give me the focal length I need to re-create a similar image frame as my original DSLR version.